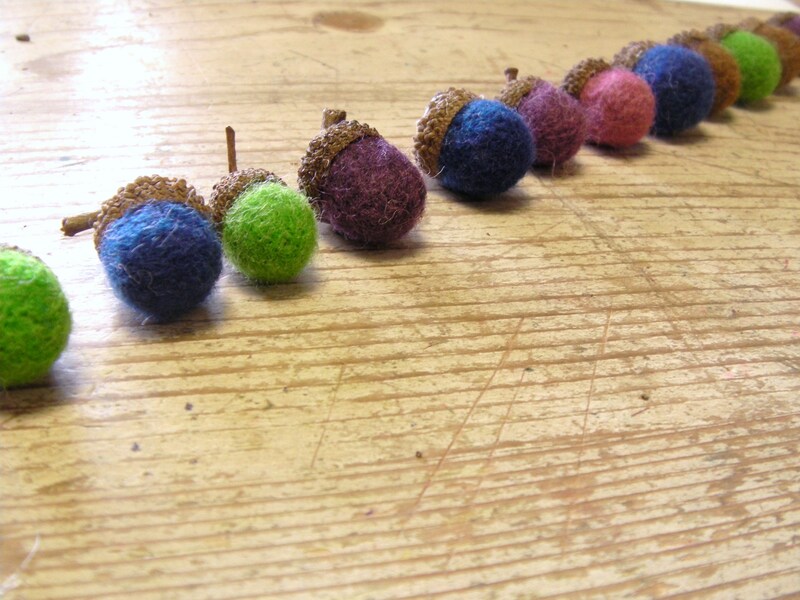 Making Felt Acorns. . . A Great Fall Activity! I just love fall; it is by far the best season for everything!!! 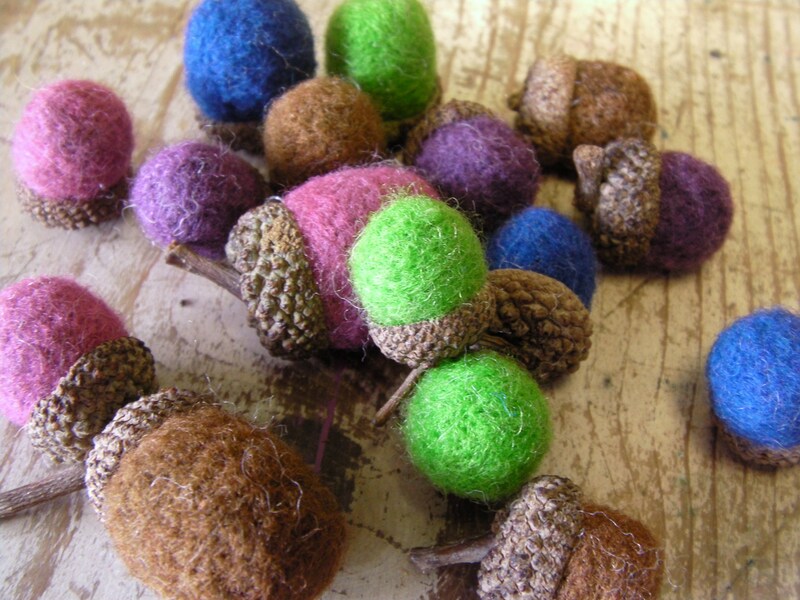 Today, in celebration of this wonderful season, my kids and I made some brightly colored felted acorns. It’s a really great matching game for younger ones and for older kids it’s still lots of fun! To be fair, I must admit that this is not my original idea. I tried to discover the originator of this craft, but it is so widespread that I couldn’t locate the artist who began it all. This is a pretty straightforward project, but I will tell you the step by step process in order to make it super clear. First things first, get out there and visit your local park, find an oak tree and scour the ground for acorns. Even my youngest child enjoyed collecting the acorns(she’s 2). If the acorns are still attached the the top, just pry the suckers off. 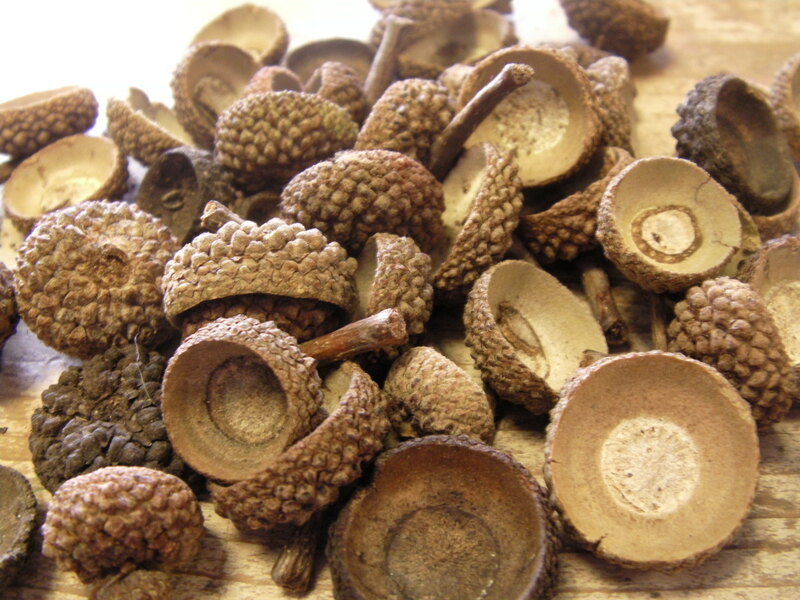 Now, you have a collection of acorn tops. 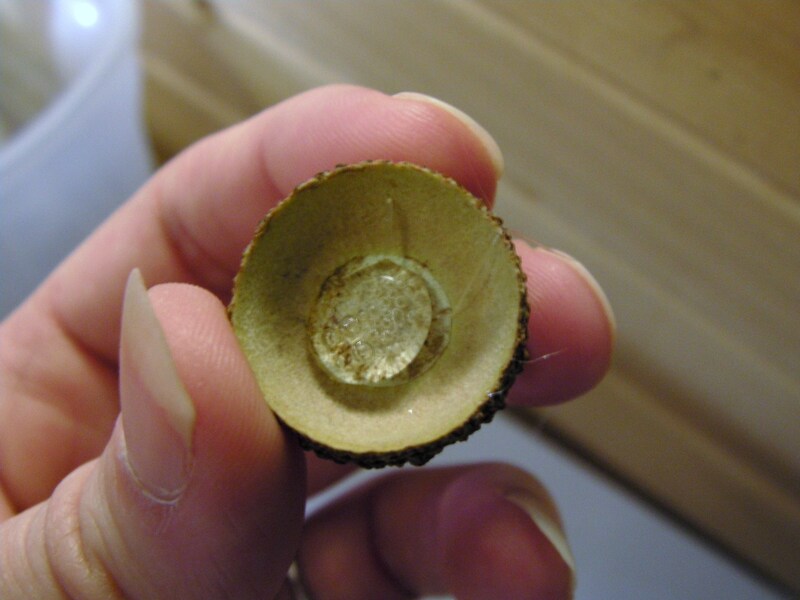 To make the acorn tops last longer, you can shellac or paint with a gloss. I skipped this step as I didn’t have this supply on hand. But I highly suggest it, if these are intended to be keepsakes! While you were looking for acorn tops, hopefully you noticed the beautiful colors that adorn the acorns themselves. Use this as inspiration for the colors you choose to felt with. I chose green, mauve, dark blue, dark purple, and brown. 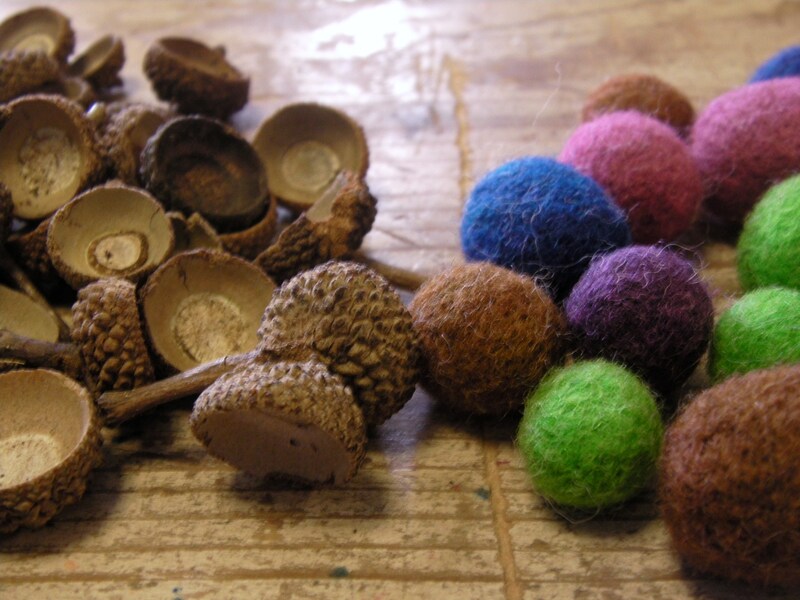 Now with your acorn caps resting nearby, begin to make a few different size needle felted balls. I simply rested an average cap nearby and made some larger, some the perfect size for the cap, and some a little smaller. Now match them up. 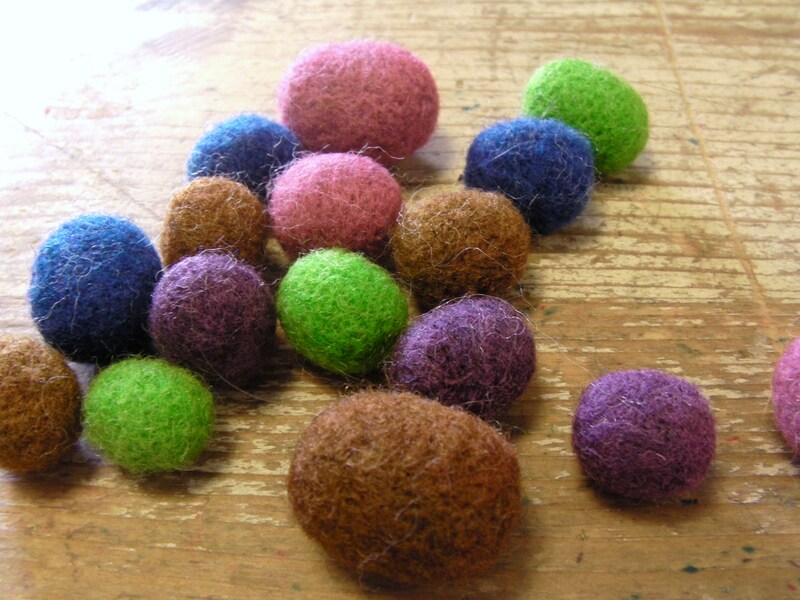 This is also fun for children, let them match the correct sized cap to the needle felted ball. 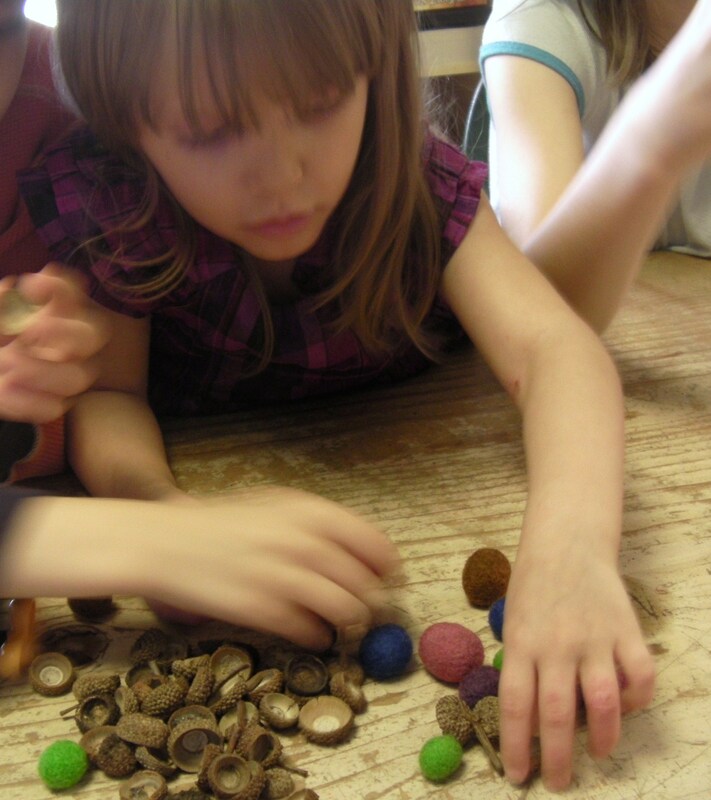 It’s a great sorting activity and all natural. The textures and colors are sure to please. 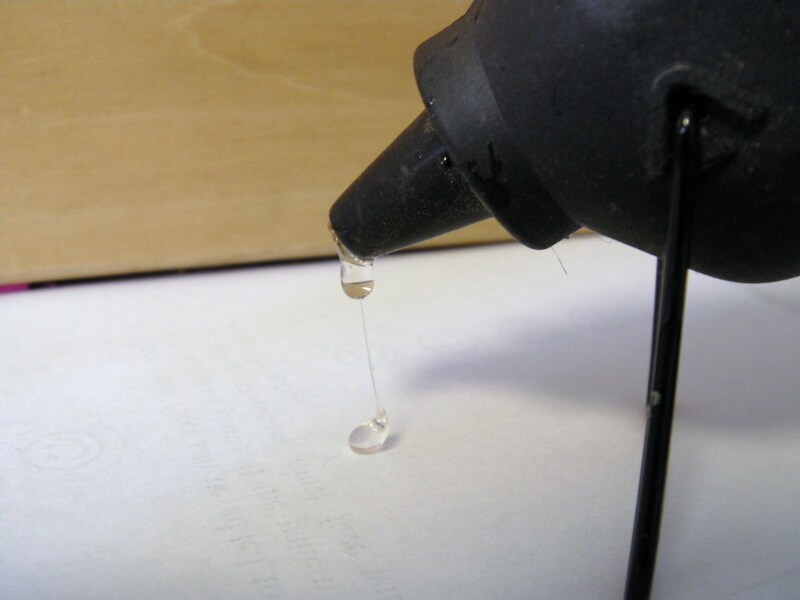 Now fire up that hot glue gun. You could use Elmer’s, but it doesn’t set as fast. 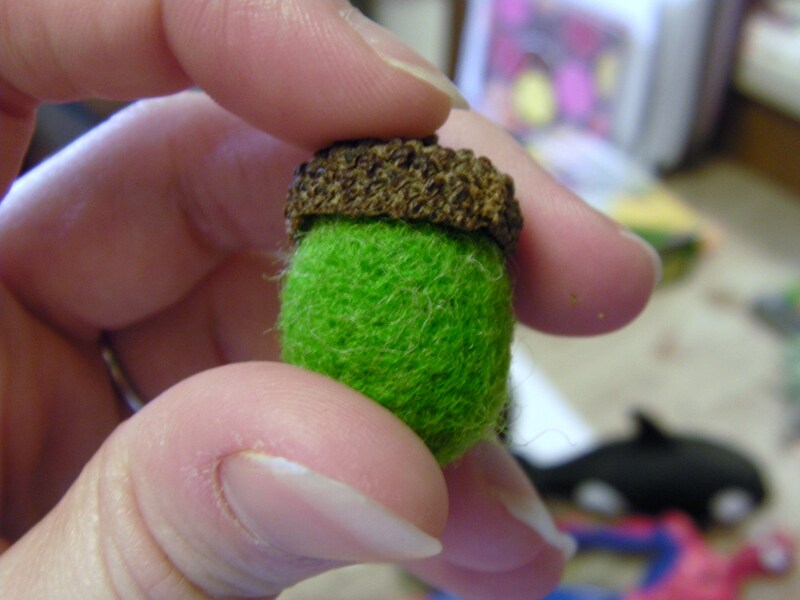 Put a little drop of glue in the acorn cap, position the matched felted ball inside it and keep pressure on it until the glue sets. 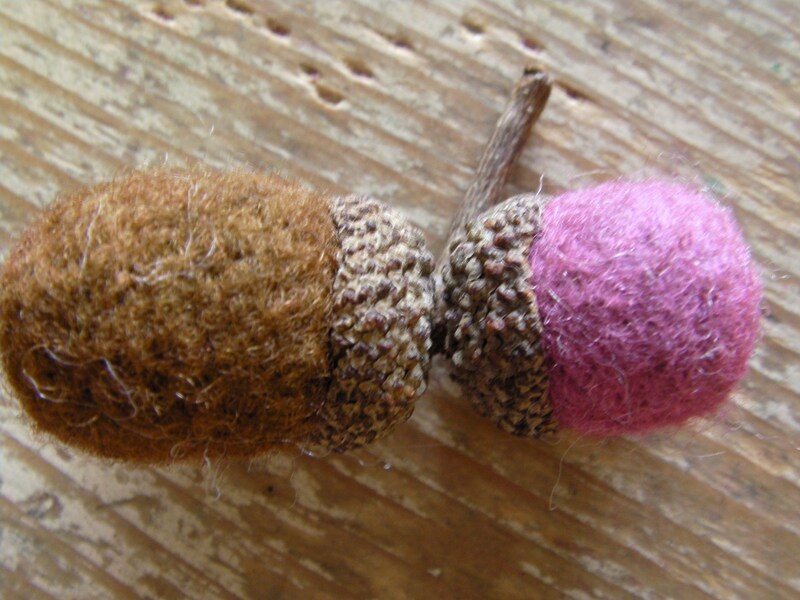 The felted acorns are now complete, but what do I do with them? I have an activity planned with my children, but they are also great fall decorations. Place them in a pretty bowl, or hang them in a row as festive garland. I’m sure there are more, but I’m going to let you use your imagination for more decorating ideas. Get outside and do something with your loved ones; it’s a beautiful season! Happy Fall! 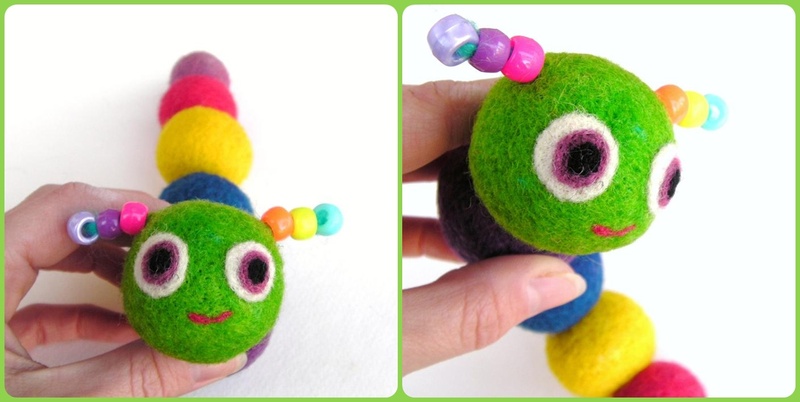 Caterpillar. . .Soft Fuzzy Felt Balls on a String! 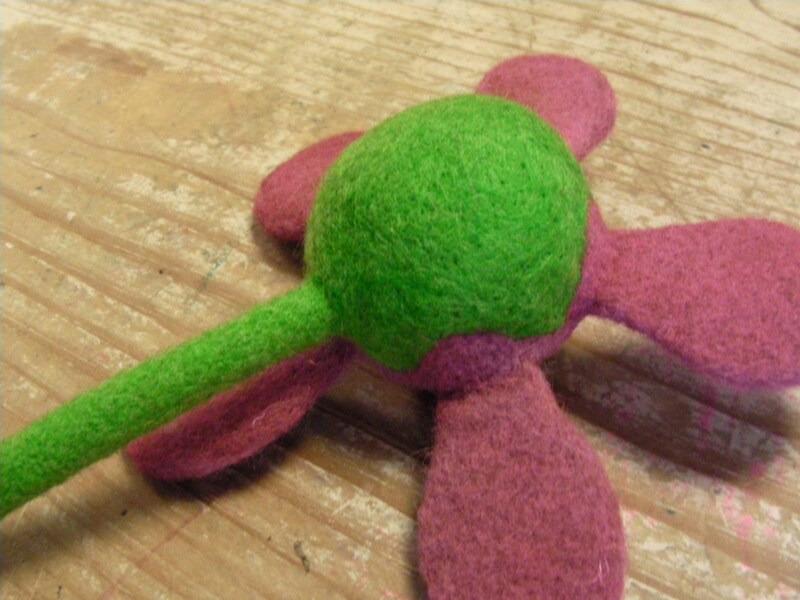 I followed my imagination and made a colorful felted caterpillar. This colorful creature is unlike my previous creations because I used a few different materials to construct his wiggly body. 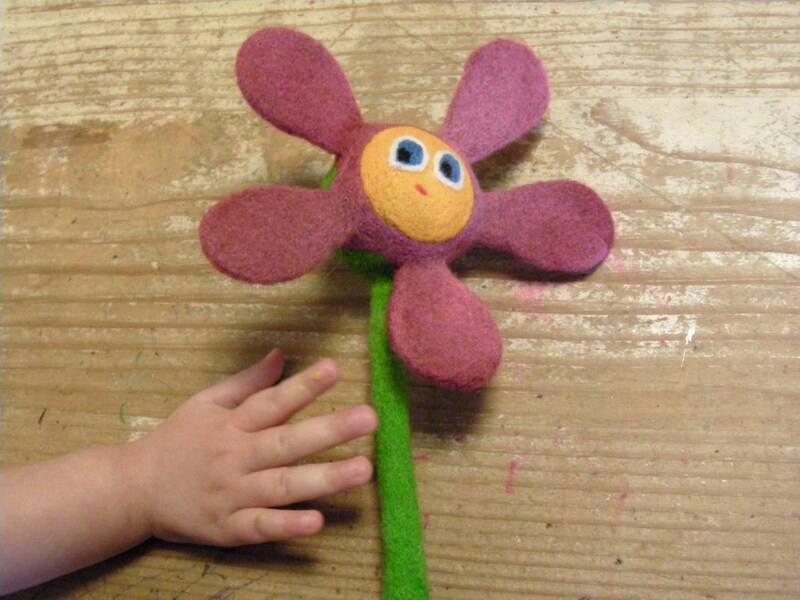 This toy design used wool, pony beads, buttons, and wool yarn. I think he turned out just adorable. If only real caterpillars had such a friendly face! I made 6 individual balls, put a face and antennae on one, and then strung them together with some wool yarn. I wanted the caterpillar to be able to curve just a little; which is why I strung them together rather than felting them together. I really like his pony bead antennae, but I think wood instead of plastic would have really complimented the natural wool construction. 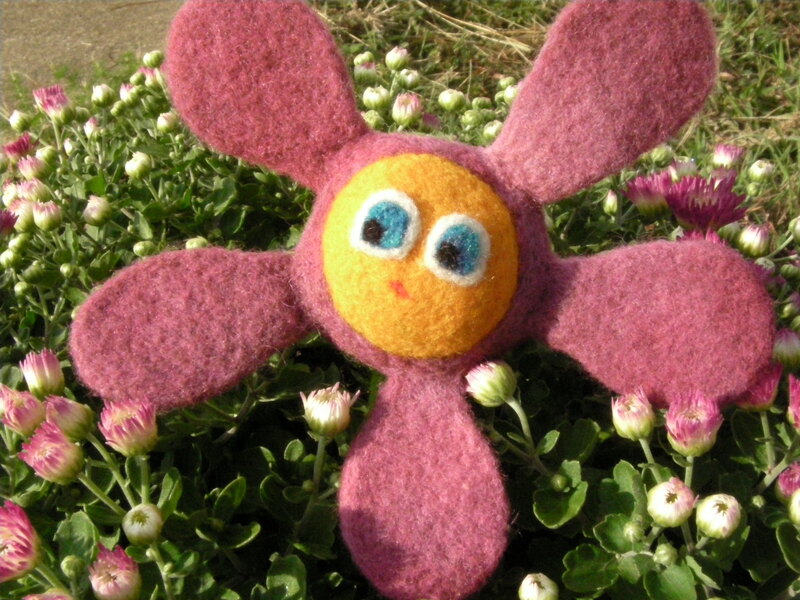 Also, felted beads would look fantastic as antennae. 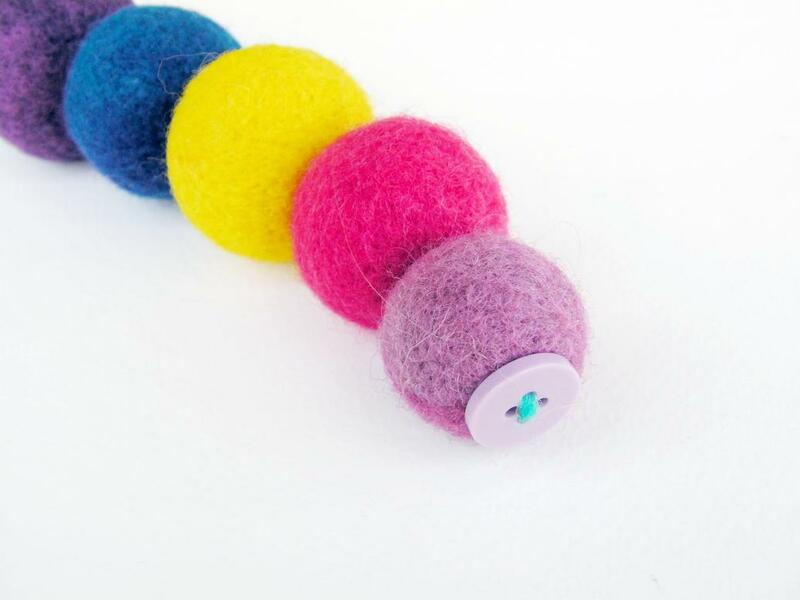 I haven’t really got into the felt jewelry craze; but if tiny felted beads could compliment my little felt toys I’m going to have to give it a try! I haven’t attempted such miniscule needle felting tasks yet, mostly for fear of poking myself while working in a tiny area. 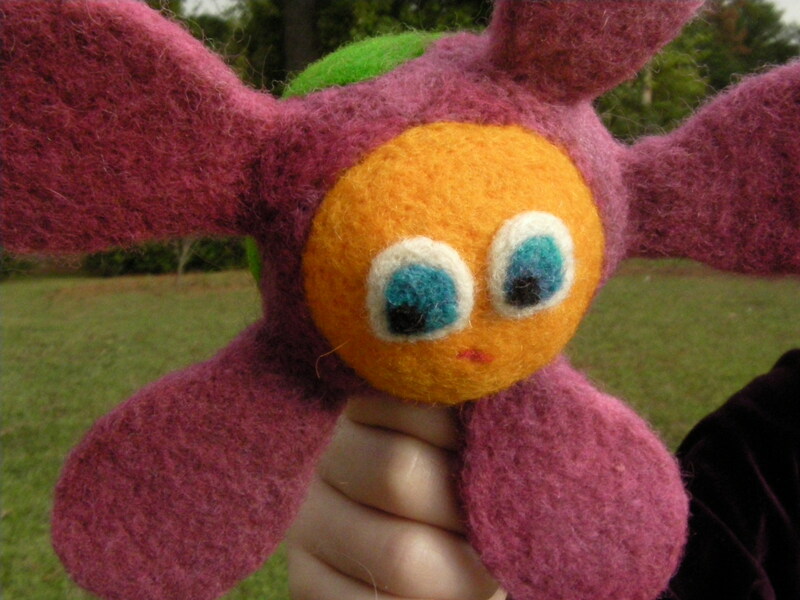 But I can’t stop imagining this little guy with felt bead antennae, so I will probably make him again in the future when I have mastered the technique of felting beads! The tiny pieces make it inappropriate as a crib toy, but I think under adult supervision this toy would intrigue even the littlest baby! Even my eleven year old was impressed with this one; and it’s hard to impress her! All in all this little toy was a joy to make. It’s bright, colorful, happy, wiggly and so adorable. 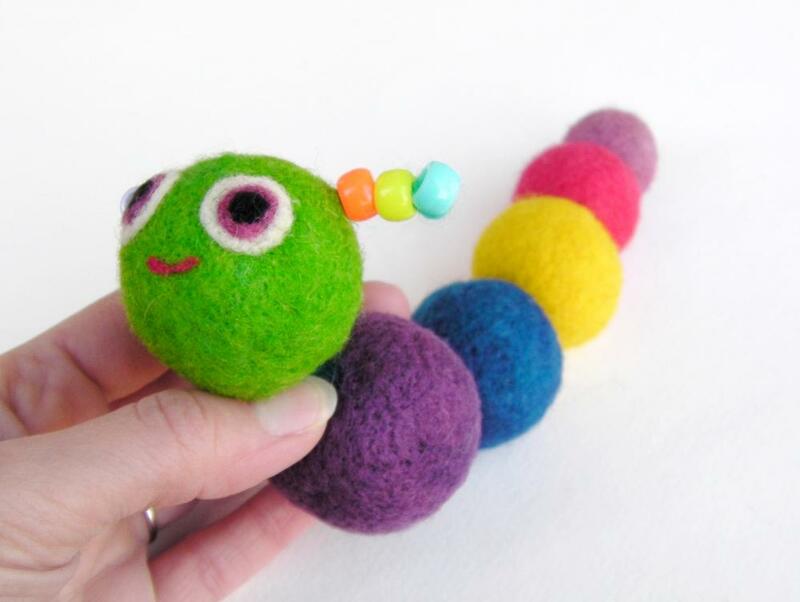 It’s a really simple concept and hopefully I’ve inspired someone to try a felt caterpillar of their very own! Felt Saturn . . . perfect for imaginative play! Saturn is complete; it’s time to celebrate! 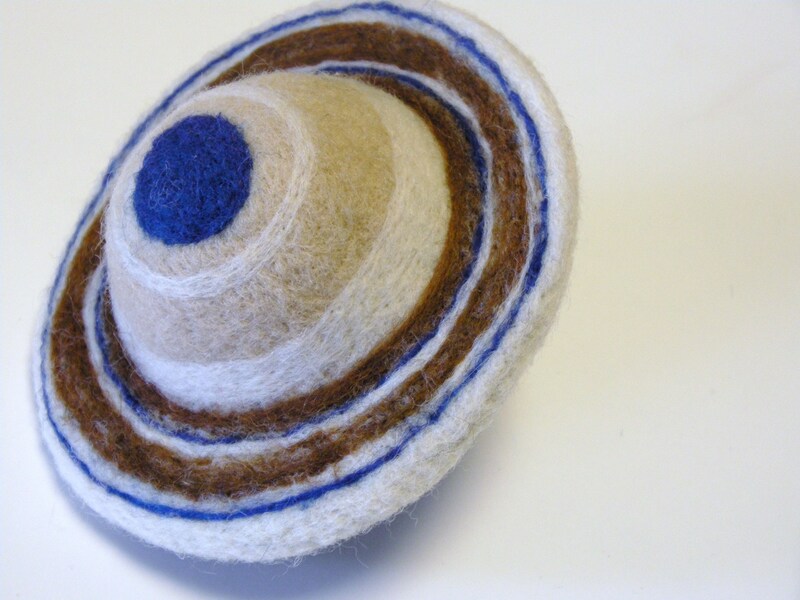 This felted Saturn was quite a challenge. I just kept at it and fiddled around with the rings and the density of the fibers until it was just right. I tried to somewhat maintain a color scheme that resembled that of the actual planet. While I was creating this planet, I had some ideas for future projects. The first idea was inspired by the rings of the planet: a felted chain. I thought why not leave the planetary body out completely and just felt a long soft chain of rings; you could then hang a toy on them or simply turn one ring on the chain over and over again. So be expecting a multi-colored felted chain in the future! Also, I realized that my children were very intrigued at the extra ring around this toy ball. So, I might use this ringed ball as a prototype for some more colorful and imaginative balls in the future. Maybe instead of rather dull planetary colors, I can use some bright vivid primary colors. And last but not least, this toy can move. 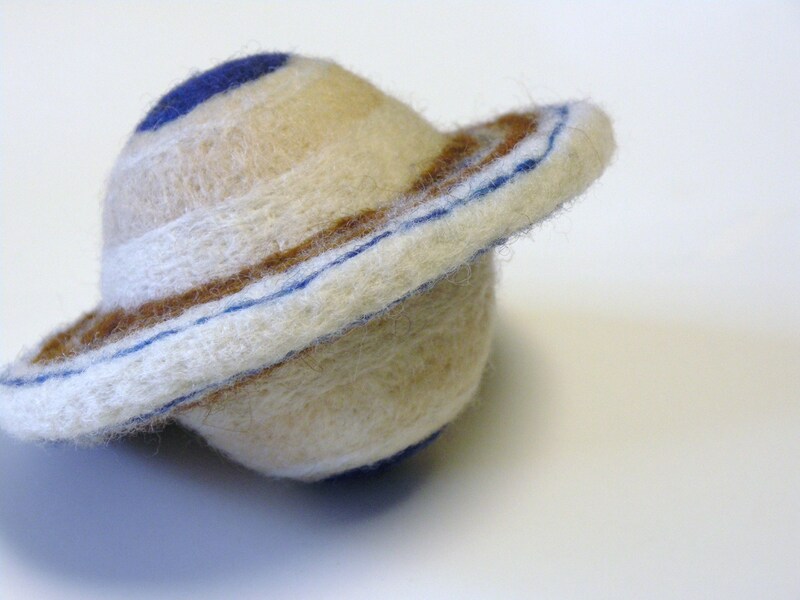 I was trying to create a little toy Saturn and I did; but I also created my first felted top. 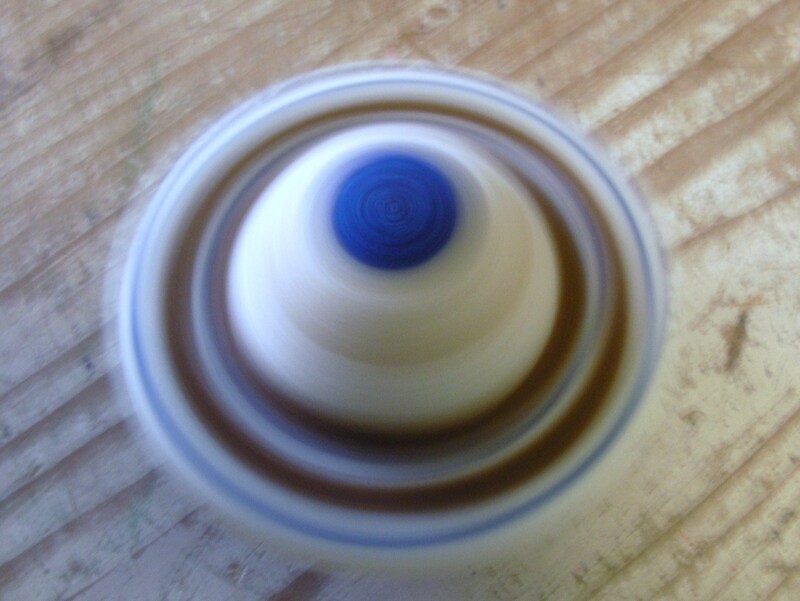 Just watch it spin. You can also roll it on the edge of its rings as a wheel down the hallway floor. The point is: this was one of my most challenging and unforgiving projects, yet I walked away with much more than a felted Saturn. I walked away with some great ideas. What more could you ask for?